The Head of the UN May be Missing, I am very worried. Sometimes my wife make fun of me, she says that I am such a worrier. Usually my concern surrounds my kids, family or a close friend, never a public figure. Lately my worry is causing me to lose sleep and it's not even someone I know personally. 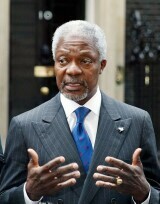 I am very concerned about Kofi Annan, the Secretary General of the United Nations. He is a great moral man, even won the Nobel Peace Prize. Kofi Annan is always the first to speak out when there is even the slightest perception of nation doing wrong. Remember how took a stand in the Mideast, saying how can Israel be right and the whole world wrong? Remember how quick he was to raise awareness of Jenin when he thought that there was a massacre there? This guy is a neutral peacemaker with high moral standards. Over the last few weeks he has been strangely silent. The longer he is silent, the more I am concerned for his well-being. When Israel captured all those documents directly linking Arafat and the Palestinian Authority to terrorist acts, I just knew he would indignantly challenge Arafat to clean up his act. Yet this man who fights world morality was silent. That's when I began to suspect that something was up. I scanned the newspapers every day looking for his comments. Nothing. Originally I figured that he is a big Star Wars fan; he was one of the thousands of people waiting on line for days for the new movie to open. He couldn't get to a phone; he would lose his place on line. We can all understand that. Last month, when a Palestinian terrorist blew up a pool hall right in the middle of Ariel Sharon's visit to the White House to discuss a plan for peace, I raced to newspapers to hear our great Nobel Peace Prize winner to speak out with outrage. I couldn't find his comments anywhere. Why hadn't he spoken out? He couldn't still be in line. That's when I became convinced Kofi Annan had disappeared. I made it my personal challenge to find him. First I thought he must be ill so I called all the hospitals near the United Nations building in New York, but he wasn't there. A few days later when a Palestinian gunman shot and killed some Jewish boys playing basketball, I scanned the news channels, but I could not find our U.N. Secretary General speaking out against it. "Oh my" I thought, "he must be working on something very serious." Then it came to me. Maybe his kids are getting ready for sleep-away camp and he is too busy buying them supplies to realize what is going on. I can relate to that, supplying a kid for camp can be pretty arduous. So I called all the camp supply stores but they hadn't seen him either. They were very nice though; most of them took my number and agreed to keep an eye out for him. When 14-month-old Sinai Keinan and her grandmother Ruth were among those who were blown apart by a Palestinian suicide bomber outside an ice cream parlor in Petach Tikva, I knew that even getting ready for camp would not keep Mr. Annan silent. Day after day, I would scan the news channels, but there was still no sign of Kofi. What would a man of justice be doing that was so important that would stop him from speaking out against state-sponsored terrorism, especially terror that targets young children? Of course, Kofi being a man of justice, he must be working with O.J. Simpson to help find the real killer of his ex wife. I knew that the O.J. search had moved to the South Florida golf courses, so I began to call them. "Have you seen O.J.? Is Kofi with him?" I turned up nothing. One guy I spoke with named Manny who works on a golf course in Del Rey Beach, Florida, told me that I was crazy. "Don't you get it?" He said to me, "It's just like the 1940's. Some people are killing Jews, others are just watching and doing nothing. Kofi Annan just doesn't care about Jewish blood." Manny has to be wrong. Mr. Annan is a great peacemaker, a big shot in the U.N. He would not stand idly by while woman and children are targeted for terror just because they are Jewish. He must be very, very busy. I just wish I could find out where. It seems like every few days, dozens are killed or maimed in anti-Jewish terror attacks. Most are in Israel, but some are in France, in Russia, all across the world. In Norway they are labeling Israeli products, reminding people of the yellow stars that Jews had to wear in Nazi Germany. Yet throughout this, the Secretary General of the United Nations, the great man of peace, has been missing. I am running out of ideas for places to look. As you go about your day, please keep an eye out for him. Let me know if you see him. Tell him to call. I am so worried.